Argon Neonatal/Pediatric PICC and Midline catheters are designed specifically for this patient population. Catheters come in a choice of silicone material or polyurethane material. The option for safety and non-safety introducers is designed to enhance first-stick proficiency. 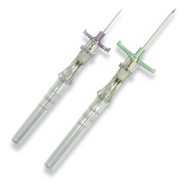 The BD™Introducer Instaflash™ Needle Technology (pictured left) provides rapid visualization of blood return along the catheter shaft and is designed to enhance first-stick success in highly vulnerable patients.